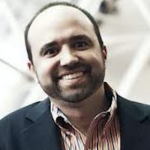 Joe Pulizzi is the founder of Content Marketing Institute, the leading education and training organization for content marketing. He is also the author of Content Inc.
Joe Pulizzi says that’s what most businesses do, whether they’re tiny startups or large corporations. And their audience lets out a collective yawn. Joe says the first step actually starts with niching down. For instance, Joe had a client, a pet supply store, that wanted to blog about pet supplies. But how was that going to help them differentiate themselves from the big box pet stores, which are doing the same thing? And with a much bigger budget? So first, Joe helped them niche down. “What we found out is they had a strong expertise around a product line for people that like to travel with their pets,” he says.